Last summer, Instagram announced that it had reached the impressive milestone of one billion users worldwide. With that number still rising steadily each day, you may feel more compelled than ever before to launch advertising campaigns on this platform to attract new shoppers and secure a few more sales before the end of the calendar year. Doing just that would be an excellent idea. The reason: Instagram has a fairly robust advertising program in place for businesses. You can do a lot when it comes to creating the right type of content for your audience, targeting the right people and building campaigns around specific goals and objectives that can fuel business growth. 1. Go minimalist with typography. It probably won’t surprise you to read that most Instagram posts and ads use photos or videos of people, places, products or other objects. That’s why when you see an ad on the platform comprised primarily of text and nothing else, it stands out. So, why not try this strategy? Try launching an ad that features a single sentence, statement or offer, contrasted against a subtle background. This example from the New York Times is particularly eye-catching. 2. Get clever with the zoom feature. Most users are accustomed to seeing ads on the platform, and they’ll quickly scroll past anything they think looks too forceful or predictable. One creative way to grab attention and boost engagement is by utilizing the zoom feature introduced a few years ago on the platform. For your next Instagram ad campaign, hide a word, phrase or promo code in your image and add a comment that asks viewers to pinch and zoom to reveal it. Noosa Yoghurt received a ton of praise for this example. The best and most effective ads on Instagram are the ones that don’t look like ads at all. In fact, your ideal customers will appreciate this. You never want people to feel that you’re trying to "sell" them or trick them into buying something. To achieve this goal, avoid using stock photography at all costs in your ads. Instead, create engaging lifestyle photography that showcases how your product could and would be used in real situations, and by "everyday" people that viewers can relate to. See how Under Armour used lifestyle photography to attract and engage with its own ideal audience. 4. Remarket to "abandoned cart" shoppers. Another way to grab attention and drive sales on Instagram is to launch ads that remarket to shoppers who left your store without purchasing the products they wanted. Remarketing allows you to put product images back in front of would-be buyers in an effort to get them to go back to your website and buy what they left in their shopping cart. To launch a remarketing ad on Instagram, follow a few specific steps, including adding a Facebook pixel to your website. There are plenty of in-depth guides you can reference to help you learn how to build a remarketing campaign on Instagram. To get started, dig into this helpful resource from AdEspresso. 5. Tell a story with video. 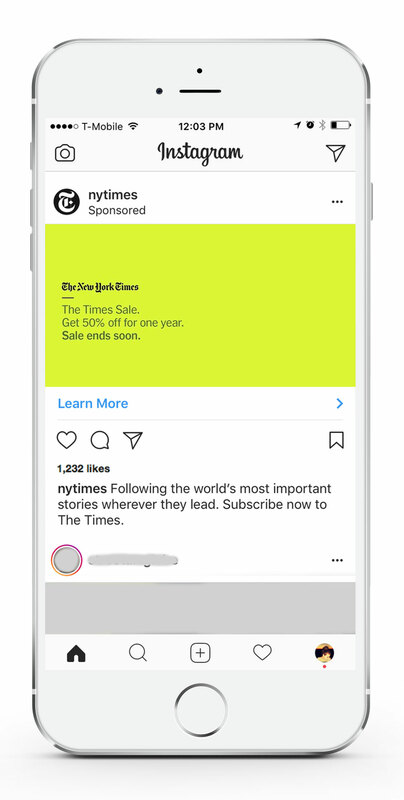 Another way to reach your intended audience on Instagram is by creating and launching captivating ads that run within the Instagram Stories section of the platform. According to Instagram, over 400 million accounts are now actively using this section of the app. Stories, in fact, presents a big opportunity for business owners who are willing to put the time, energy and money into creating unique, entertaining stories that users can see and interact with while viewing other stories from the people they follow. Batch Organics ran ads in Instagram Stories that helped the brand successfully increase click-through rates. Mainline Menswear ran ads in Instagram Stories that helped the brand boost brand awareness in an increasingly competitive product category. Padani ran ads in Instagram Stories that helped the brand educate potential customers on the types of options they could choose from when shopping on Padani’s website. 6. Unbox a product with a "carousel" ad. "Unboxing" videos and photos are everywhere in the ecommerce world. Why? Because consumers want to be absolutely certain of not only what they are getting when they order a product, but what the experience will be like when they actually receive it. On Instagram, you can document the unboxing experience for one of your products by creating a carousel ad. A carousel ad allows you to place multiple photos or videos within the same ad. These photos or videos can then be swiped through by users who encounter your ad in their feeds. You can even build carousel ads into Stories. Here’s a great example of this from Nike. 7. Build an audience-segmented collection. Instagram also allows ecommerce business owners to create "collection" ads on the platform. Collections make it easier for users to discover, browse and purchase products from inside the app. To see an example of what a collection looks like, go here to see how Ashley Furniture is using collections to drive sales with its audience. If you want to take things one step further, try creating a collection that fits the needs and wants of a very specific niche group within your audience. For example, outdoor goods company Yeti is currently creating holiday-shopping gift idea campaigns that target specific groups within their audience. The brand has gift lists for surfers, hunters and ranchers. Any of these lists could easily be made into a collection ad on Instagram and targeted directly at people who share those specific interests. As Facebook builds new tools for users and businesses on Instagram to use and benefit from, the platform only continues to grow in popularity. If you haven’t experimented much with Instagram ads before, don’t wait any longer. Spend the next few weeks thinking about your goals, your audience, your budget and the type of ad you want to create to help your ecommerce business soar.